A familiar foe Owen Sound Attack continued their winning ways against the Barrie Colts this season pushing their winning streak to 14 games. 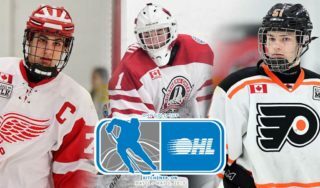 Having last played on Saturday, Jan. 14, the Attack’s tilt with the Colts on Saturday evening marked their only game of Week 17 of the Ontario Hockey League season, while the Colt’s were looking to finish off another 3 in 3 weekend. The Colts knew it wasn’t going to be easy with the Attack so far dominating the season series between the two clubs. On this night the Colts were welcoming back former captain Cordell James, returning to Barrie for the first time since being dealt to the Attack at the trade deadline. 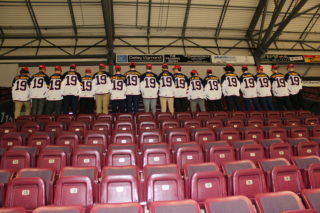 The Colts would honour Cordell with a special tribute and ceremonial puck drop prior to the opening faceoff. James would end up registering a goal and 2 assists and selected as first star of the game. Facing one of the league leaders amongst goaltenders in the CHL. Barrie struggled to get anything going against for much of the game on Montreal Canadiens draft pick Michael Mcniven. For most of the opening frame the two teams traded chances back and forth playing a tight checking game. Midway through the first period the Attack would score on their first opportunity on the powerplay. With Owen Sound working it around the Barrie zone, Kevin Hancock fed Petrus Palmu off the wall firing a shot from the right circle beating Ruan Badenhorst five hole for his 26th goal of the season. Minutes later, the Attack were looking for more. Badenhorst would catch himself out of the net to play the puck putting it directly on an Attack stick, but Badenhorst raced back into position preventing a sure goal. Before the period was over Owen Sound would add another on the powerplay. Maksim Sushko potted his 9th, an unlucky deflection going directly off a Barrie skate and into the back of the net. Ethan Szypula and Sean Durzi picked assists on the goal. Barrie would head into the dressing room after 20 minutes down 2-0. Four minutes into the second period, Tom Hedberg would move the puck up ice to power forward Roy Radke making a tremendous effort to drive it to the Owen sound net beating McNiven over the shoulder, his 9th of the season. Owen Sound would come storming back just one minute later adding to their lead to go back up by 2 goals. The highly touted draft eligible Nick Suzuki would beat the Barrie defense and find Marcus Phillips all alone at the hash marks snapping one over the glove hand of Badenhorst. With two minutes remaining in the middle frame, the Colts would get hemmed in their own zone. Off a turnover at the Colts blue line, Palmu would send a shot from the point perfectly on the tape of Ethan Szypula redirecting it into the Barrie goal for his 7th of the year. Cordell James would get an assist on the play. After forty minutes the Attack would lead up 4-1. Going into the final period of play the Colts would need to find an extra gear to amount any comeback in this contest. But the third period would be much of the same. Owen Sound continued their dominance over the Colts adding two more goals by James and Sushko. Giordano Finoro would score one late on a Colts powerplay, with assists going to Curtis Douglas and Justin Murray, but that would be it in this one as the Attack would skate to a 6-2 victory. Next game for the Colts will be once again with the Attack in town for a Thursday night match up on Jan. 26, in what is a re-make of the Dec. 15 game that was postponed due to inclement weather.